American Airlines is coming to Gainesville. 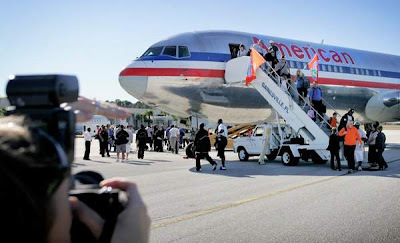 The carrier will present two round-trip flights a day to Miami starting Oct. 1, Gainesville Regional Airport spokeswoman Michelle Danisovszky said Monday. That boosts the number of round trip flights to 13 a day out of Gainesville, on top of Delta's service to Atlanta and US Airways' service to Charlotte, N.C.
Daily departures from Gainesville to Miami are now scheduled for 7:45 a.m. and 1:20 p.m., with Miami to Gainesville flights at 11:15 a.m. and 8:20 p.m. The airport has received a important number of letters from business people, consultants, lawyers, faculty and staff at the University of Florida, including people based in Miami, to show American the require for Gainesville-Miami service, Danisovszky said. We've been talking with them for years and giving information, and annoying to be as helpful as probable in figuring out the amount of traffic that would be there, she said.